A Bright Corner: Pinwheel Block tutorial with Tri-Recs Rulers + Ruler Giveaway! 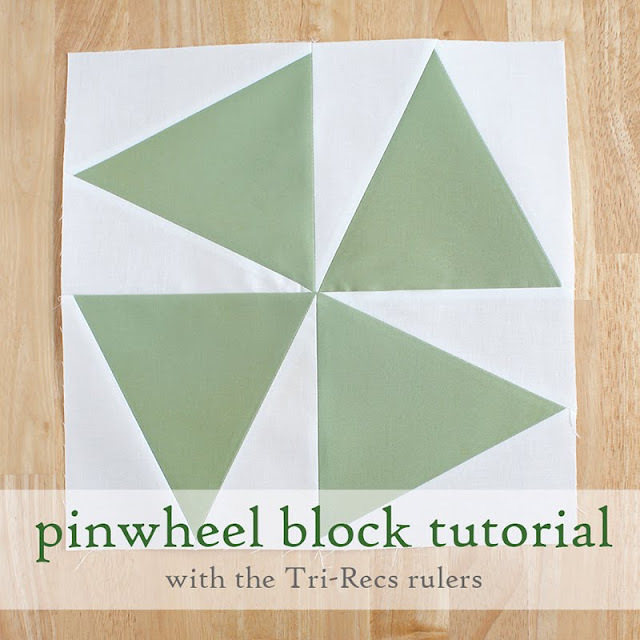 Pinwheel Block tutorial with Tri-Recs Rulers + Ruler Giveaway! 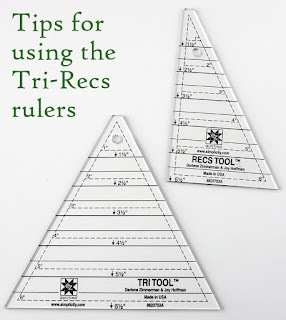 I bought these Tri-Recs rulers years ago and then they sat for a looong time because I didn't know how to use them! Now that I know, they're super handy and you can do all sorts of fun blocks with them. Today I'm just showing the pinwheel block, but once you get the hang of them, you can start just creating! 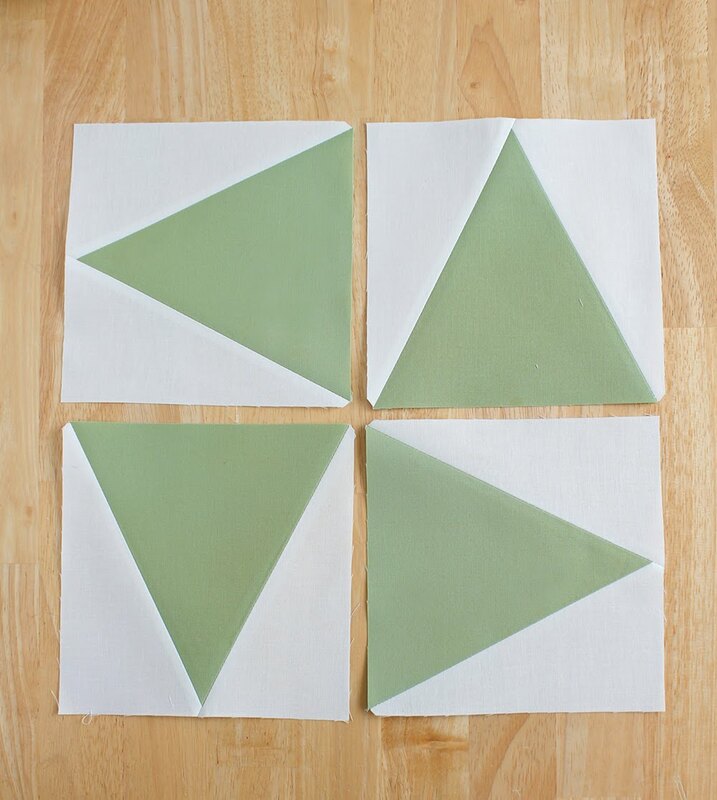 The pinwheel block for today is really just four triangle-in-a-square blocks that have been rotated and sewn together. Let's get started! 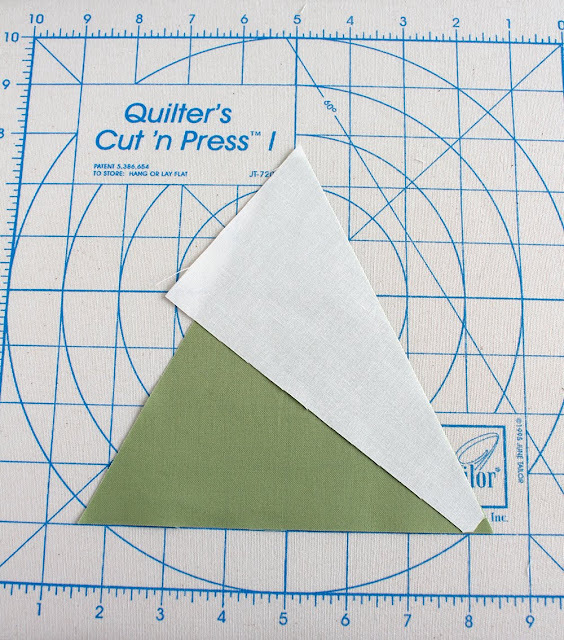 First of all, cut a strip of fabric that is 6.5" x WOF (width of fabric). You can keep it folded (the way it comes off the bolt) and that way you'll be cutting two triangles at a time. Line up the "Tri" ruler on the strip of fabric as shown. 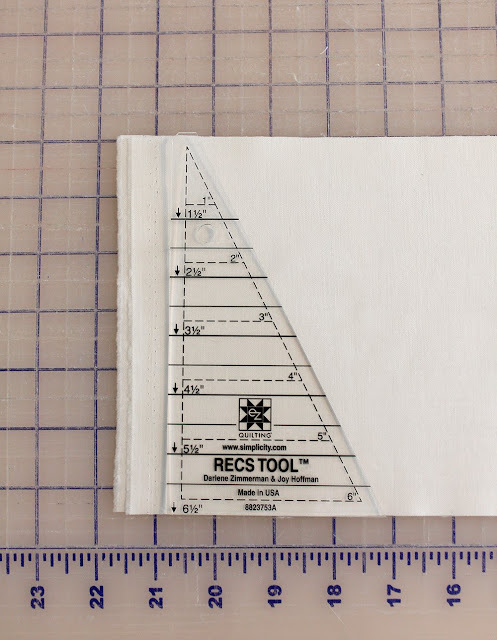 That nice flat edge on the top of the ruler is helpful here! See how it lines up with the top of the fabric strip? 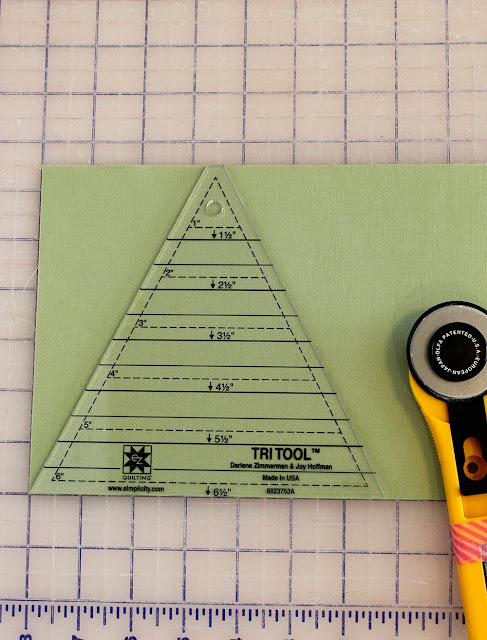 Use a rotary cutter to cut out one triangle, then flip the ruler over and line it up along that just-cut edge. You're ready to cut another triangle! 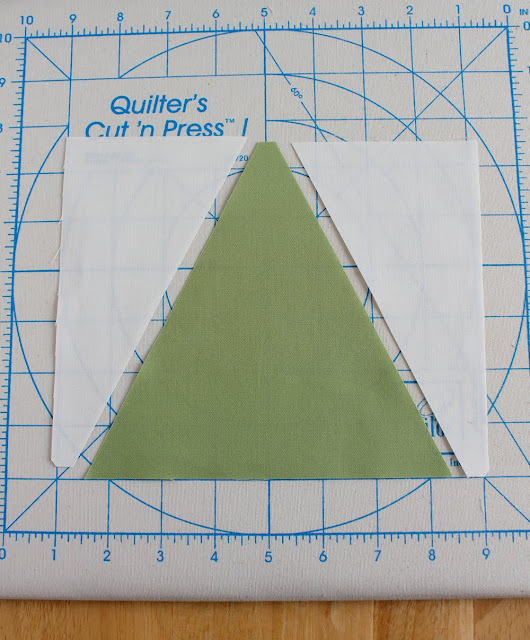 Keep going along the length of the strip of fabric, cutting out as many triangles as you need. For one block we only need 4 triangles. 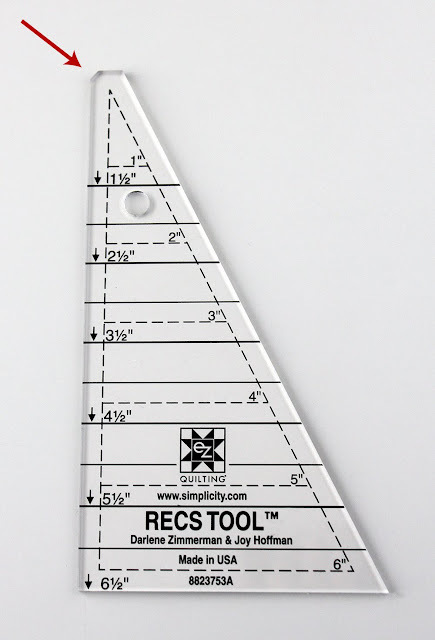 Next up we'll be cutting the side triangle pieces using the "Recs" ruler. 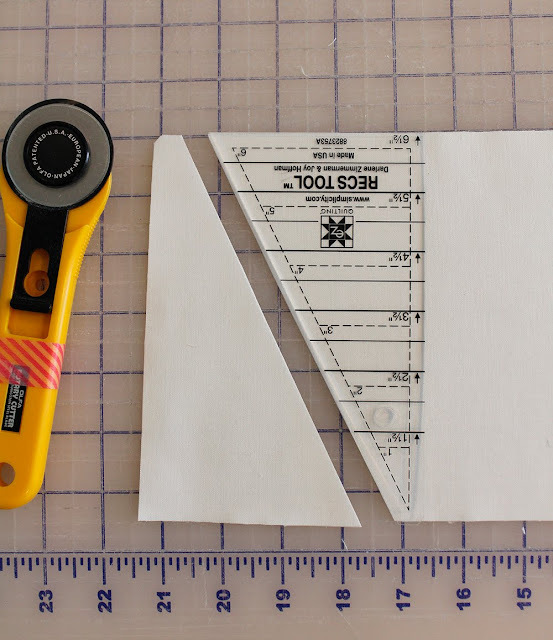 Once again, cut a strip of fabric that is 6.5" x WOF. See that notch on the top left of the Recs tool? That notch will come in handy when you start piecing the block. 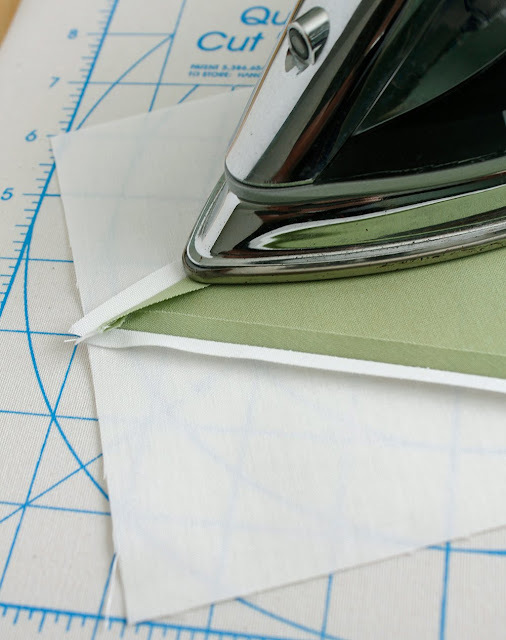 So make sure you trim that notch from the fabric as you cut! Line up the ruler as shown, and cut one triangle. 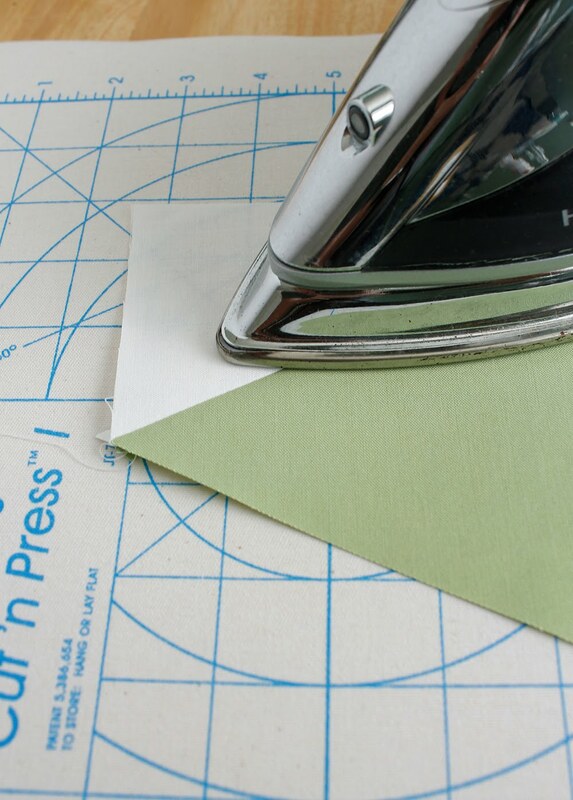 As before, flip the ruler over and cut another one. And then just keep flipping and cutting all the way down the length of the strip. For our one block you'll only need 8 of these side triangles. Time to sew! 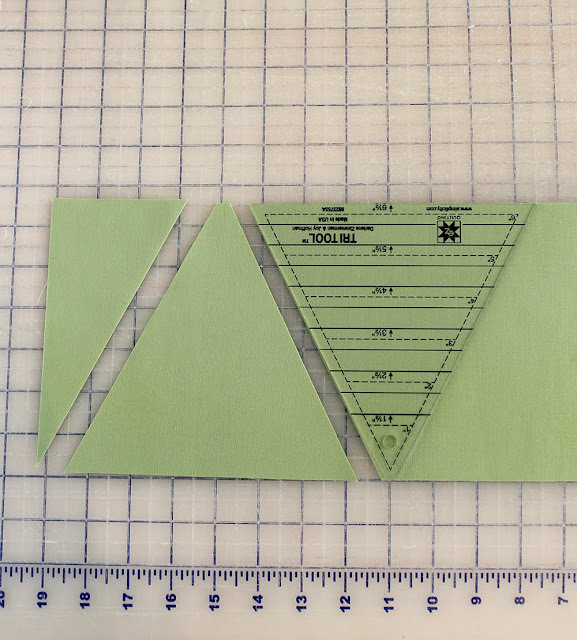 Arrange one triangle piece with two side triangles as shown. We'll sew one side first. Flip the side triangle over so the two pieces are right sides together. Notice the bottom corner of the triangle? 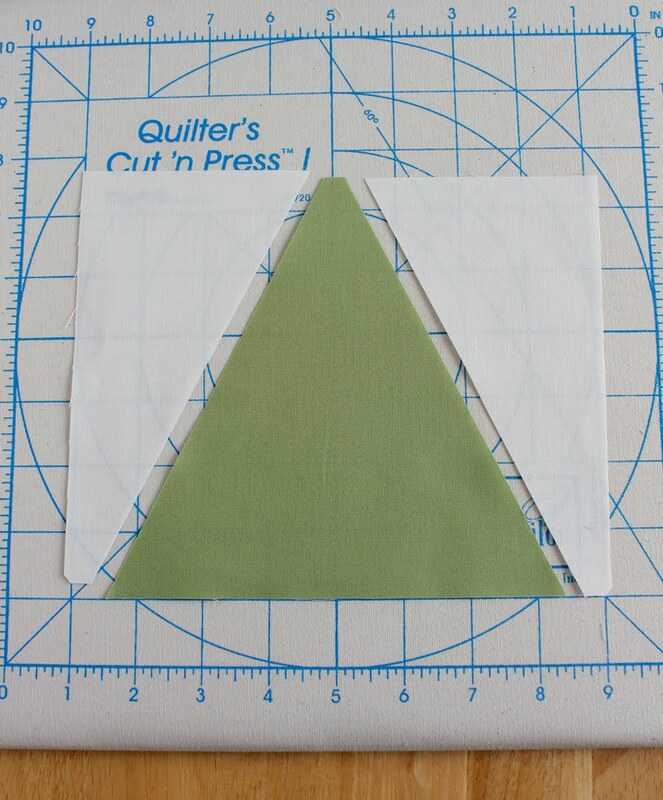 That notch you cut in the side triangle piece helps you line it up with the larger triangle. The notch should line up with the bottom edge of the large triangle. 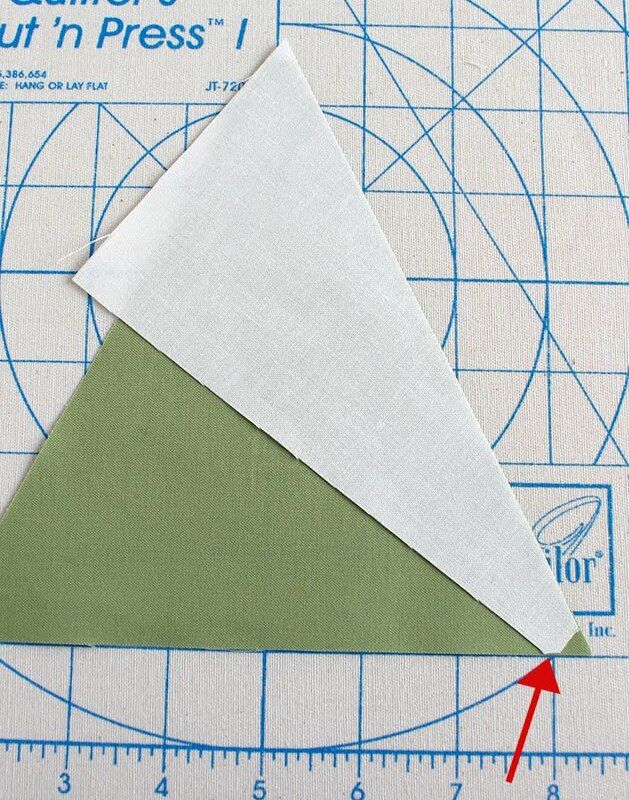 Stitch along the side of the triangle with a 1/4" seam. Flip open the side triangle and press. I recommend pressing open. 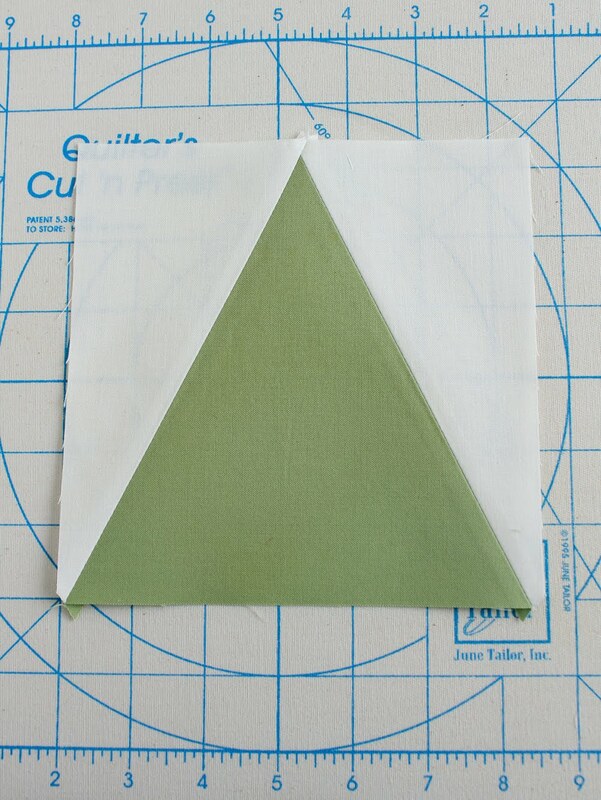 Now line up the second side triangle - making sure that notch at the bottom is lined up. Sew with a 1/4" seam. 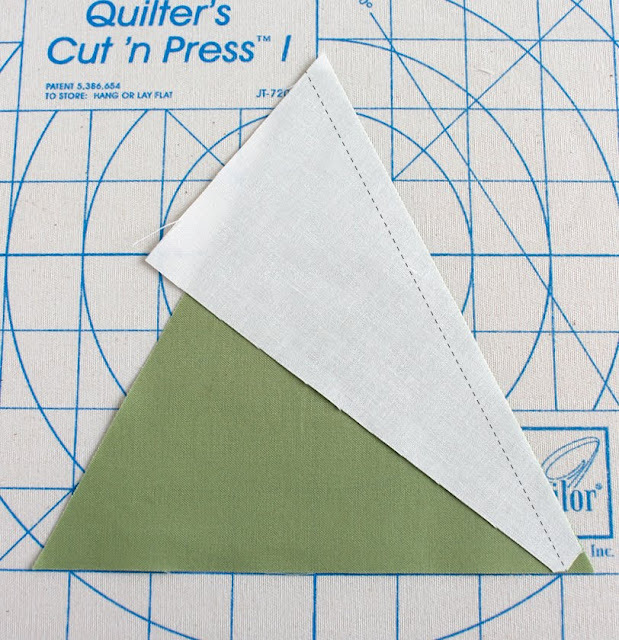 Flip open the second side triangle and press open. 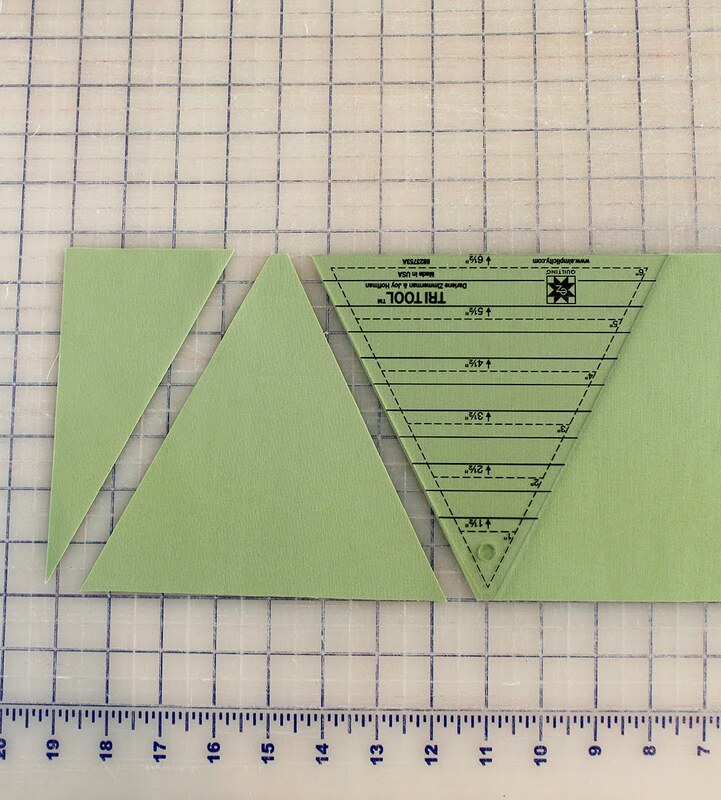 This triangle-in-a-square (TIS) block should measure 6.5" square. Repeat to make a total of 4 TIS blocks. Take a minute to trim off any little dog ears on each block. Arrange the four blocks as shown, taking note of how each one is rotated. Sew the top two blocks together, and the bottom two blocks together, with a 1/4" seam. Press seams open. Now sew the two block halves together, being careful to line up that center seam. Stitch and then press seam - this time press to one side. The finished block should measure 12.5" square. Fun block, right? 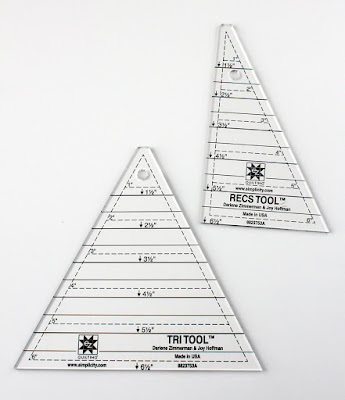 Would you like to win a set of Tri-Recs rulers? Just leave a comment below, telling me one thing on your Summer bucket list. Giveaway ends Sunday July 2nd at midnight and I'll announce the winner here on Monday July 3rd. And thank you to the Fat Quarter Shop for sponsoring the giveaway! International entries welcome, one entry per person please. Giveaway has ended - thank you! 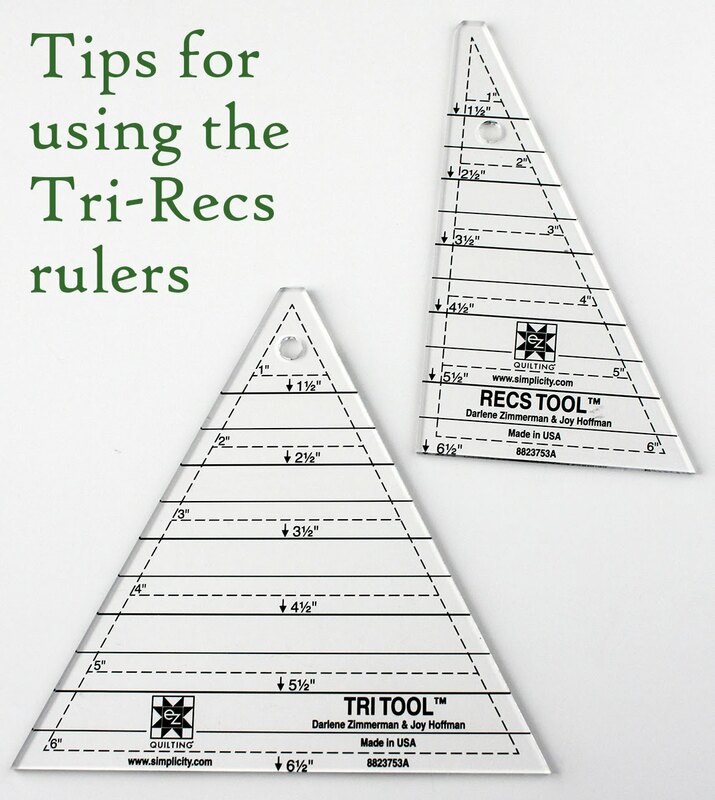 Want to see what else you can make with the Tri-Recs rulers? Check out this pinterest board - filled with different ideas on what you can make using these two rulers! 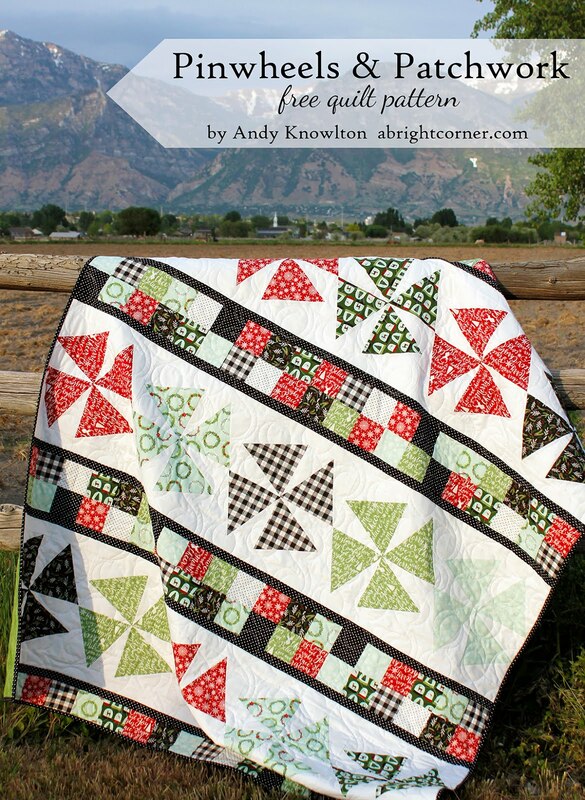 And don't forget to go here and download the free pattern for the Pinwheels & Patchwork quilt. 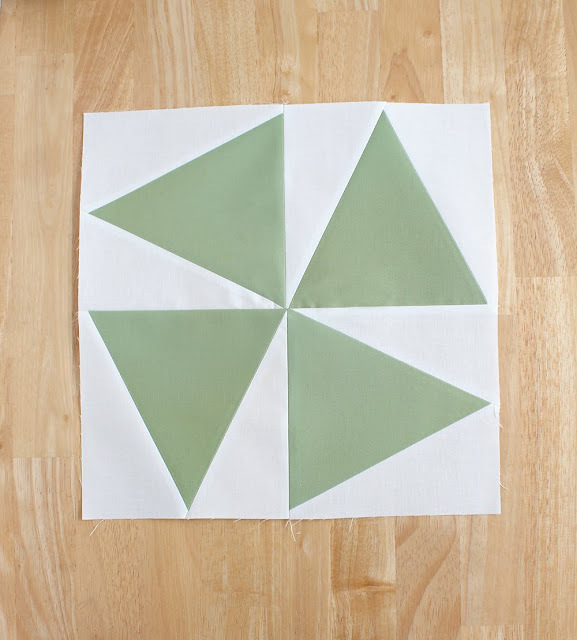 Now that you know how to make the pinwheel blocks, this quilt's a breeze! On my summer bucket list: pressure wash the back porch. bucket list for summer is to finish a couple of picnic quilts for my twin sisters! Bucket list: finish binding all my quilts! My summer bucket list? Enjoy my last summer with my oldest child, who is going to be a Senior!! My summer bucket list includes sanding and painting my bathroom cabinets. Hmmm, these rulers look like they'd be pretty handy to have, for sure! Summer bucket list.....that means doing something I've not yet done........except for trying new blocks and sewing techniques, I don't have any this year. My partner has been laid up with health issues, so no new adventures this summer. Finish #mytexasroadtripquilt. It needs to be quilted and bound. Rulers look interesting. I love your quilt. Thanks for pattern. My Summer Bucket List includes finishing "Teddy's quilt", which is a work of love that has been lingering far too long. I'm making progress! I am moving this summer from Texas to Tennessee! Until I unpack my sewing room there's no quilting. But I would like to make your pinwheel quilt! Finish all projects I've begun before starting any new ones.Or is that just a dream! Love your pinwheel tutorial. It has just gone to the top of my summer bucket list! Sewing with my granddaughter is always #1 on my summer list. Got to do that today, and hopefully we will get to do some more tomorrow. 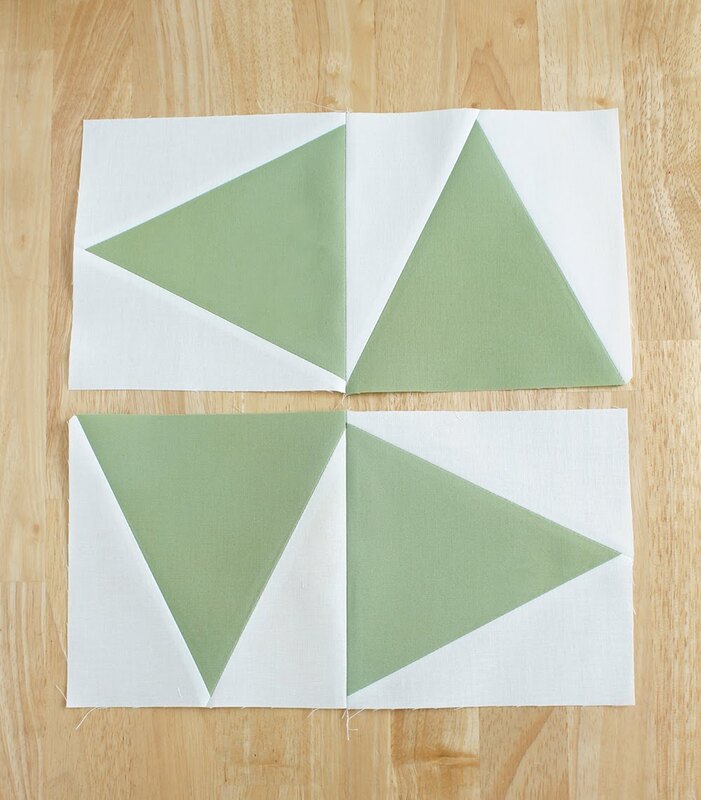 Summer bucket list: My DIL just asked me to make a pinwheel quilt for her new baby (due Aug). This tutorial came at the perfect time:) Thanks! My daughter and 3 grandsons arrive today so I will not be sewing for the next 2 weeks. I am sure the house will be full of chaos and lots of fun. Then I need to put the binding on 3 quilts for our Oct quilt show. To be able to sit down and sew and sew and sew !!!!! Great tutorial! Thanks for the chance to win the rulers ! Bucket list: Spend more time each day in the sewing room doing what I love! Thanks for the pattern. Love these rulers and have had my eye on them for awhile! Quilt and bind our family camping quilt...WIP for almost 2 years. Ugh. I have GOT to paint our great room! Been putting it off too long!! Love those pinwheels! My summer bucket list - have 2 gift quilts that need to get quilted/bound! So beautiful block and fantastic tools.My summer bucket list is :one of my sister and family will be here so I will do hexies,read books, walking ,go to the beach and cooking. I'm sold! The ruler for the sides and that notch...genius and boy would that save a lot of time and trouble! Bucket list project would be writing a quilt pattern that has lingered for far too long! Or making my first bias tape full size quilt! What I would love most for the summer is to go out in the canoe, just me and my husband... We work many long hours away from home so this would be a total dream bucket wish! HI! What a great tutorial>a Keeper for sure! Thanks for your Blog+a neat Giveaway too! I desperately want to FINISH A QUILT this summer. Having 2 toddlers makes for little sewing time for mommy. My plan was to finish at least one quilt a month. So far I'm not doing really well. so thanks for the give away. My bucket list is so big that I need an extra bucket! One of my priorities this summer is to finish my Postcard From Sweden quilt. The top is finished (and I adore it! ), so now I need to piece the back and get it quilted, then add binding. I need to let the weeds grow in my gardens for a day or so, so I can get this done! 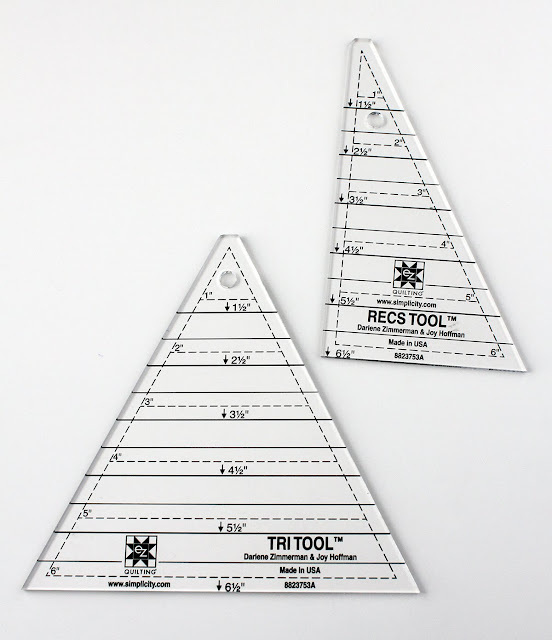 I'd love to play with these rulers! My summer bucket list includes getting a website going to showcase a gallery of my finished quilts. Spend more time on the mountain. We were planning to build a cabin this summer but haven't been able to keep a builder so I'm just trying to enjoy the old trailer one more year. I've started taking my featherweight and I have to say, I'm happy as a clam to sew on the deck, listening to the wind in the trees and taking in the view every so often. Thanks. To get outside and spray baste all the quilts I've pieced over the winter. I love anything quilting that makes things easier and accurate at the same time. 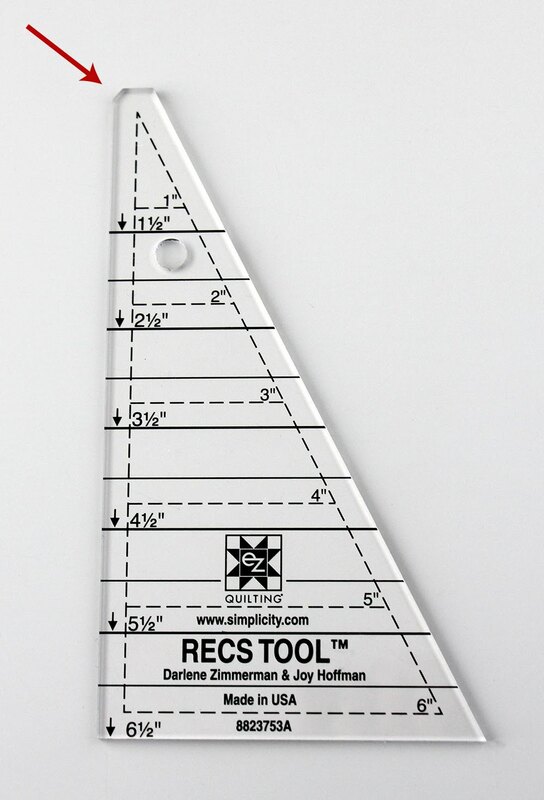 I would love to add these rulers to my quilting studio. 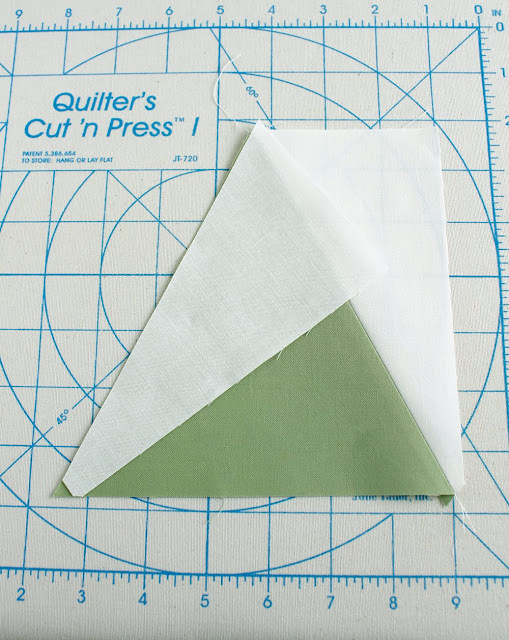 I plan to try some turned-edge applique. I am hoping to finish a couple of projects, number one a quilt I made for my son! But keep getting distracted by cute projects like this one! Thanks for sharing. Quilting with friends at a beautiful retreat in Wisconsin is on my agenda. Can't wait! I just retired after 38 years in education. My summer will get to go past the first day of school! We are taking a trip to Seattle and Portland AFTER school starts back!